In our earlier discussions we have examined in some detail the central ideals and values which moulded the Indian epical age and the ancient Indian civilization in general. We are now in a better position to take a critical and retrospective view of these old Indian ideals in a more integral and futuristic perspective. Do they have any relevance for the present or future age? Many of these ideals are considered as “eternal” in the ancient Tradition. How far such claims are true? How much of them are of enduring value? If there are elements in them, which are enduring or useful, what are the modifications to be made to make them more relevant to the present or the future? These are the question, which we will discuss in this series of articles. This article examines the ideal of Chaturvarna, the four-fold social order in an integral perspective. As we have explained earlier, the central psychological principle behind four-fold social order, Chaturvarna, of ancient India is that for a smooth and rapid psychological and spiritual development, and also for functional or professional efficiency of the individual, the outer social function or occupation of individuals have to be in harmony with their inner nature, temperament, inclination and capacities. A modern management expert may have no difficulty in accepting this very sensible and rational proposition. In fact this psychological principle behind Chaturvarna is now increasingly recognized in modern management thought and practice. For example the concept of psychometric tests, used extensively in the corporate world, aims at testing the psychological, attitudinal and temperamental compatibility of the candidate for the job. But the predominant aim of Chaturvarna in ancient India is not some mundane benefits; its aim is to provide a social and psychological framework for the inner development of the individual towards his spiritual goal. However, in ancient India some major defects have crept into the theory as well as practice of Chaturvarna. In practice, the principle of Chaturvarna had degenerated into the caste system based on birth and hereditary. In the early Vedic and epical age, the caste system, though its physical basis is still birth and hereditary, retained its psychological significance. This is because, in the families of the higher castes, Brahmanas and Kshathrias, the higher values, ideals, qualities and knowledge inherited in the family are transmitted from one generation to the next and enforced through a system of traditional education and discipline. So in this early phase of Indian civilization, the Brahmana and Kshathria families carried the psychological atmosphere of their respective Varnas. This in turn attracted the Brahmana and Kshathria souls to be born in those families. Thus the caste system in this early period of Indian history is not merely physical based on birth but psycho-physical. But in later ages, the psychological element of Varna slowly disappeared, leaving only the physical kernel of birth and hereditary. But Sri Aurobindo brings out a lacuna even in the theory of Chaturvarna. This ancient Indian thought seems to assume that an individuals is exclusively of a particular type like Brahmana or Shudra and tries to shape his nature within the limited boundaries of a single type. But no individual is entirely of a particular type. In each individual there are the faculties of knowledge of the Brahman; power, will and action of the Kshathria; mutuality, co-ordination and adaptation of the Vysya; work and service of the Shudra. It is the most dominant power, which determines his unique swadharma. So the aim of human development should not be confined within the limited perfection of a single type. 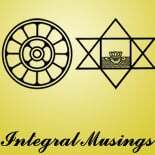 So the highest aim of human development cannot be the Typal Man but the Integral Man in whom all the four-fold powers of his nature and soul are fully developed and harmoniously integrated around his spiritual self, with perhaps one of the powers leading the rest, but without suppressing them. The Vedic ideal of human development was perhaps closer to this integral aim. But in the post-vedic age, the ideal of a lonely and world-denying spiritual salvation gained the upper hand over the broader ideal of integral development of the human potential and its harmonious self-expression in society, which is perhaps the vedic ideal. In this later post-vedic development, the main idea is that each individual can reach the spiritual aim of life by following the bent of his typal nature. This means or implied in it, there is no need for a Vysya or Shudra or women to develop the faculties of knowledge or power. By following the social function which is in tune with their respective typal natures, like obedient service or trade or domestic occupation or duties they can attain salvation. As a result, these sections of the society which are at the lower levels of the social hierarchy were not given sufficient freedom, opportunities or encouragement to develop their full human potential, participate fully and contribute effectively to the outer life of the society. We have to retain the ideal of spiritual liberation Moksha but also recover the more integral ideal of the Vedic sages and create a new spiritual and social synthesis which is in tune with the present condition and the future evolution of humanity. The modern democratic ideal of liberty and equal opportunity for all to develop their full potential is much more conducive to the integral growth of the individual than the ancient Indian ideal of typal development. So this modern democratic ideal will be an important part of the future social syntheses. But this modern ideal has to be integrated with the ancient Indian ideals of spiritual awakening, inner growth through work and matching of outer work with inner nature without restricting it to a one-sided typal perfection but with an expansive urge towards integral development. For example the Shudra-type of personality, even while pursuing an occupation which is in harmony with his inborn nature, has to develop the light of knowledge of the Brahmana which will help him to do his work with a clear understanding of the laws and principles of the activity; aspire for higher values and the Kshathria’s sense of freedom, honour, dignity and responsibility in work which will elevate and ennoble his activity; acquire the right adaptive skill of the Vysya which will make his work more efficient and effective. This principle applies equally to the other three types.